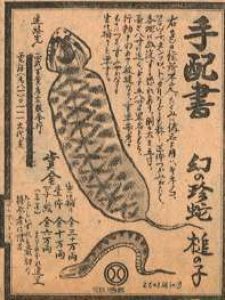 The Tsuchinoko is a snake cryptid with its origins in Japan. The cryptid occasionally goes by other names like Tsuchi-Hebi in Osaka, and Bach-Hebi in Northern Honsho. It measures at two to three feet and is known for its unusually large and distinct scales. The creature’s name is loosely translated as “child of hammer,” “hammer’s spawn,” or “child of dirt.” It is usually described as having a rust or mottled black color. The belly is reportedly orange, and one of its most distinctive features are its large and bulging eyes. The eyes are said to have a very hypnotic stare that can entrance anyone who looks directly into them. Its mouth is in an eternal grin, and its head is also dotted with horns. The Tsuchinoko is said to be highly venomous. It can also spit its venom directly at its attacker, making it even more dangerous. Fortunately, the snake is skittish and frightful, so it will avoid human contact, if possible. Strangely enough, the snake emits a pleasant odor, akin to the blossoms of a chestnut tree. snake is also said to have the unusual ability to leap as high as six feet in the air. Some reports have even said that the snake can swallow its tail and roll like a wheel, just like the similar cryptid from America, the Hoop Snake. It is said that the Tsuchinoko is a lot more noisier than the average snake. The Tsuchinoko can mimic various sounds and voices of other animals. It can bark, chirp, squeak and moan. Many popular stories even say that it can speak like a human. Legends say that the creature is a great speaker who likes to lie and deceive. There have been countless tales of Tsuchinoko speaking with weary travellers, and trying to lead them astray. The stories often concluded with the animals only being sated with alcohol. There are even references to it in the Kojiki, the oldest history book of Japan. 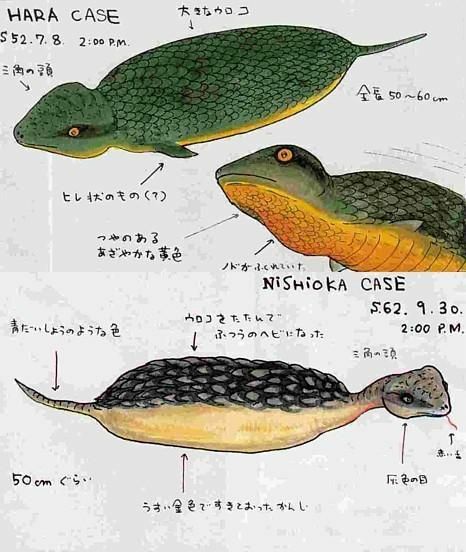 The towns of Mikata and Yoshi both claim to have remains of the Tsuchinoko in their possession, however this has not been officially verified. It is most commonly spotted in the Mikata town of the Hyougo prefecture, so it is no surprise that the remains of one are said to be there.